This page is about the picture or drawing. For the programming language, see Logo (programming language). A logo is a picture or drawing that is used by a person, group, or company to mark who they are. A wordmark, or 'logotype', is a logo made entirely of a word or words. It is usually the name of a product or organisation. A company or group can use a 'logo' on the things that they make, like on the things they sell, on letters, and in advertisements. When a person sees the logo picture, that person knows that the thing they see the logo on came from that company. Logos can have letters and words in them. Many logos have the name of the company or group in them. Most logos are very simple drawings with only a small number of colors. Some logos are only in black and white. In many countries, companies and groups should tell their country's government about the logo they are using. If they do this, the government can help stop a different company or group from using the same logo, so that every one can be sure that the logo is only used by the people who used it first. This is sometimes called a 'trade mark'. Logos are not used only by companies. Many schools have logos. Some cities have logos. Clubs can have logos. Even people can have their own logos if they want. The heraldic badge is probably the oldest form of logo in the world. 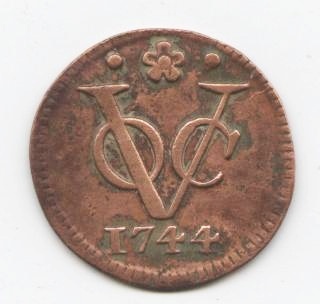 Bronze doit of the Dutch East India Company (VOC), depicting the company's monogram-logo and its date of production. The VOC monogram was considered to be a well-designed logo that ensured its success at a time when the concept of the corporate identity was virtually unknown. Logo Facts for Kids. Kiddle Encyclopedia.